And hey… all the new features & updates are free to use. Change Background Colors. Choose from an array of background shades. Toggle Light / Dark Color Scheme. Switching between light and dark schemes will change your background color as well as font color. Toggle Visual / HTML Editing. Edit your giveaway with a WYSIWYG editor or with HTML (more info on HTML basics). Access Mobile-Friendly Share Link. Use the link under the ‘Share This’ tab so your fans on mobile devices can enter your giveaway (more info). Get Tips & Tricks. We’ll keep this tab updated & pointing to articles and strategies that will make your Facebook giveaways successful. If you’re ready to launch your giveaway on Facebook, always use the mobile-friendly URL we provide at the top of your Facebook page tab. As a limitation of Facebook, apps on Facebook page tabs aren’t accessible through Facebook’s mobile app the same way they are on a desktop browser. To allow those folks who want to enter your giveaway on a mobile device (and there are probably a lot of them! ), they’ll have to be directed via the mobile-friendly share link we provide. For step-by-step instructions & visual examples on sharing your giveaway on Facebook, check out this article on our knowledge base. To celebrate, we’re giving away 5 prize packs, each containing a Rafflecopter t-shirt & stickers, a 1 mo business subscription, & a $25 Amazon Gift Card. You can enter through the widget below or on our Facebook page. Good luck! hmm i guess US$25+$10 =Google chrome cast yaee!!!! I love it and I have signed up for the contest, hoping I won! Hey I can use this! How about a new feature that helps us get more entrants? A little bold text and different background color? Would have rather seen support for Campaign Monitor or Share with a Friend extended to blogger accounts. Share with a Friend on all paid accounts seems like a no brainer; especially with your branding all over the place on Blogger (along w/suggested twitter follow). You’d think you’d want more people to see your app via more successful contests. Very definition of Win-Win. I just love the new look and features. I would love to try it out – haven’t done so yet! For some reason Rafflecopter does not work for me on Google Chrome (Macbook Air, OSX 10.8.5) – do you know of any extension that could be causing this or how I can fix it. I love using Rafflecopter but it makes it frustrating to use on my site when i have to switch browsers. hey Adrianne – shoot me an email at support at rafflecopter dot com if you haven’t already. happy to help there! Haven’t tried it yet but you make a great product so I think it’s gonna be great. I have not had the opportunity to try it yet, but I love the RC system! I LOVE that its mobile friendly! Great FEATURE!! I LOVE it! It’s so easy to use for someone with minimal html knowledge. Thanks so much!! can you add photos and how? Or still need to use the html version for that, thanks! awesome, user friendly and looks easier to fill out. Yay :) thanks for the oppurtunity! How do I change the text that shows up when the “share” link is used? I can’t figure out where it’s pulling the info from to change it. The space is blank in the “share this” option under my app tab. I desperately need the mobile-friendly link so I can post about my giveaway on my page. Help!!! Just got a reply…hopefully they can work it out! 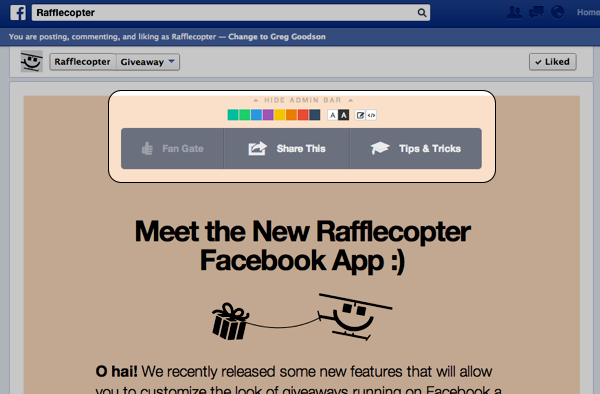 I use Rafflecopter a lot and am intrigued by the “new and improved” version. I use Rafflecopter all the time to enter giveaways. I’ll definitely have to try it! Just curious how winners are chosen. I notice a handful of people happen to win multiple flash giveaways because of the app. I haven’t tried it yet. I just heard about it right now! Amanda H as in me? how do you know? Hey Amanda – it was a different Amanda H :( Sorry about that! I am having the same problem with the loading on my Home PC since I switched my internet to DishNet. Not really sure what to do here. I sent an email and I’m waiting on a reply. Totally do not like the new layout. It has NOT worked for me on my page since the update! It is frozen and wont let me edit ANYTHING. I can go into rafflecopter and add it to another page and it works fine. Any advice on how to get it to work on my page? Mine has too. Frozen and can’t get rid of the old (closed) rafflecopter. I have deleted the app and tried to reload it (as per above I can’t find an actual app and used Rafflecopter to install) but the page comes back as the closed contest that’s frozen (even after being deleted from my FB page. Hey Angi – shoot us an email to support at rafflecopter dot com and we’ll check it out. I’m not sure if I’m a total idiot or what…but I’ve been reading all these posts on the Facebook App and clicking on highlighted words I assumed would take me to the “app” but I can’t seem to find it….how am I supposed to install it? help! I’m using Foxfire and having trouble getting a giveaway set up. Need some assistance. I will follow him on twitter and on Facebook that’s for sure !! Thanks So Much Yours Truly JoeJoeBarker !!! I can’t get my giveaway to launch. I’ve tried over and over and no luck! Can you run a giveaway in a group or is it only possible to do in a fan page? 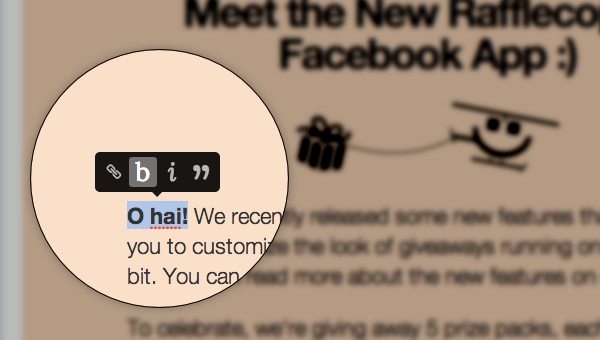 Is it possible to put the same giveaway in the fb widget AND as a widget on my blog? Can giveaways be put on Facebook event pages? Hey Stephanie! Unfortunately they can’t — 3rd party apps like our giveaway app will need to be installed on a page tab, and events are set up a bit different than Facebook pages are. Installing 3rd party apps on event pages isn’t possible unfortunately. My best recommendation would be to link to where the giveaway is running from your events page and have the giveaway run on a separate landing page or blog. I am going to scream. My tour starts tomorrow, and I cannot get the dang thing installed. It keeps saying I don’t have a page. I do. I made it today. I real live community-type Page. It keeps telling me I don’t have one. Prior to creating this one, I was already Admin on another. So, that’s two Pages it won’t see. I have logged out of everything and logged back in. Hey Shannon, send an email to support at rafflecopter dot com with your account information and we’ll check it out. Thanks! We are trying to use the timel;ine ap in a group and it will not work. Is there a way to allow a group or community on facebook to use the timeline contest app? Hi there! The app can only be used on a Facebook business page. This is a limitation that Facebook has. Great post. In my oppinion for this article! As a struggling beginner SEO this provides some great value and insight. I will work on this strategy now. I think all the above point are worth trying. How much does it cost to run a rafflecopter contest on FB? Is it possible to collect email addresses with your app? Send over any specific questions to support at rafflecopter dot com. Thanks! it says I don’t have a facebook page to use for the giveaway, but I do! I can’t seem to resolve this to launch.